Forget oil. What we have here is worth its weight in gold. A couple of weeks ago I went with some friends to dinner at a restaurant that had recently been featured on Check Please. The restaurant was El Barco. I had never been there before and was eager to try it. After we were seated, we started munching on tortillas and salsa. One of the salsas was thick, dark, and oily. "What's that?" I asked my friend who had been there before, pointing to the thick black stuff. "Crack sauce," she said. "Oh," I said. Silly me, I thought that was its name. I spooned a little onto a fried tortilla and took a bite. And pretty much melted into a puddle of bliss. And spooned that salsa on anything on my plate that had a flat surface. Don't get me wrong--the rest of the food was wonderful. I'm pretty sure the refried beans had lard in them, because they were the best damn beans I've had since I left Texas. The vegetables were roasted to perfection, the ceviche was to die for, and the carne asada was perfectly seasoned and cooked to pink perfection. By the end of the meal, I understood what my friend had meant. That salsa was the crack that raised an already perfect meal all the way up to Nirvana. We knew it was some kind smoked pepper, but I was pretty sure it wasn't chipotle. Chipotles have a barbecue-style smokiness that takes away from any other flavor, in my opinion. This was different. It was dark and fruity, spicy, and the smokiness was a clean, crisp flavor that infused every other flavor, but did not overpower. We had to ask. Our waitress was kind enough to tell us that it was a pasilla pepper, cooked with garlic and olive oil then mashed into a paste. When we left the restaurant, I was fully sated and determined to find out more about the pasilla pepper. My first search led me here. It's pretty well known in Mexico so I'm a little surprised I'd never heard of it. Quite proud of my deft internet searching skills, I emailed the link to my friend. A few days passed. I couldn't stop thinking about that pasilla salsa. I think it really is crack. Having some time on my hands one morning, I decided to do a little more research and I found a recipe for a salsa that looked close to what we had tasted at El Barco. I emailed it to my friend, who emailed back that she was going to try to find some pasillas so she could make it. She found some, and was kind enough to get some for me, too. As soon as I can plan a meal around it, I'm going to "cook" me some of that "crack". 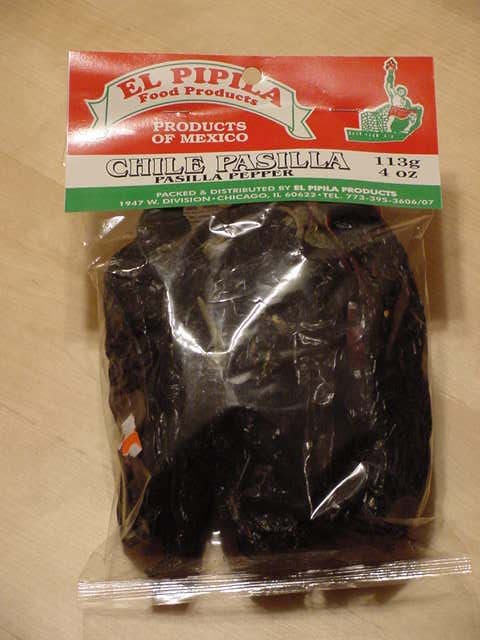 And interestingly enough, in the few weeks that have passed since that fateful night, I have heard someone mention pasilla peppers at least three different times in three different places. Ain't it funny how that happens? Do you still have that recipe for the pasilla salsa? Did it turn out like El Barco's? I'd love to see the recipe! Ah, David, I'm embarrassed to say that I never did make it. But I still have the pasilla peppers so now that you have reminded me of the recipe I think it's time I gave it a try. Heat the oil in skillet and fry the chilies until they puff. Cut off the stems, remove the seeds, and place in a blender. Add the tomatoes, bay leaves, clove, garlic and vinegar and puree until smooth. Add salt, oregano and cumin to taste. Let the flavors settle. *I don't remember there being any tomatoes in El Barco's sauce. I would leave them out and add them if it doesn't taste right. If you do try it, let me know how it works out. Thanks I will try this. I love that salsa. It is crack. I have been looking for the secret everywhere. I hope that it works out.